From Poncha Pass to Sargents. 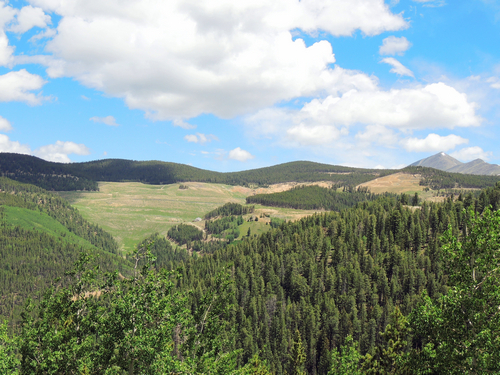 Easy, enjoyable ride on an old railroad grade as an alternative to Monarch Pass. 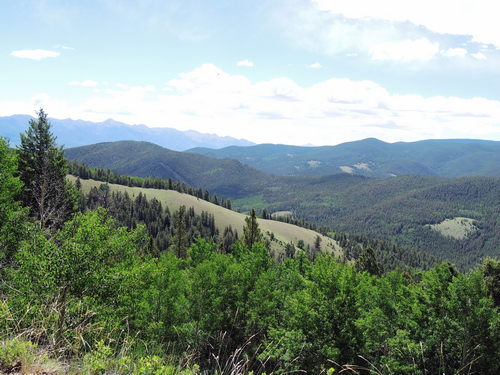 You can take a spur near the western end to see a reclaimed uranium mine owned by Homestake Mining Company. Photo to the right. 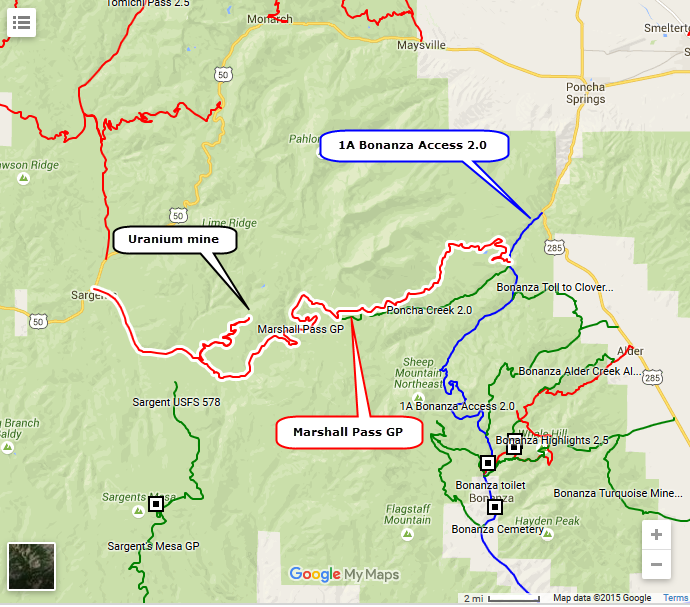 Prior to Homestake Mining Company’s (HMC) acquisition of the Pitch Mine property in 1972, various underground uranium mining operations were conducted on the property beginning with the Little Indian 36 Mine, which began operations in 1957 following discovery of uranium in the district in 1955. The direct predecessor of HMC was Pinnacle Exploration Co., a subsidiary of Callahan Mining Company, which began underground operations on the Pitch property in 1959. In 1968, Pinnacle Exploration commenced solution mining operations in the Pitch mine workings. The solution mining process included injection of carbonate solutions into the old Pitch Mine workings with uranium recovery by an ion exchange unit. The ion exchange unit operated intermittently until 1973, when it was dismantled. HMC acquired an 85% interest in Pinnacle Exploration in 1972 and eventually developed the open pit operation which commenced in 1979 and continued until 1984, when operations were suspended and the mine placed in a care and maintenance status. In 1982, the State of Colorado issued a radioactive materials license to HMC for a milling operation at the site. However, HMC never constructed the mill. Instead, ore from the open-pit operation was stockpiled until 1982 when it was trucked to HMC’s uranium mill in Milan, New Mexico until 1984. Incremental reclamation and revegetation of mine site disturbances were performed throughout the period of 1985 to 1993. In 1993, HMC initiated the process of permanently closing the mine. Mine water and storm water management at the site has included the development of a pit lake and settling pond to manage sediment from the site, plugging of the Pinnacle adit to saturate the Pinnacle Mine workings, surface water diversion structures and grading and revegetation of disturbed areas to control run-on and run-off. Pleasant views along Marshall Pass. 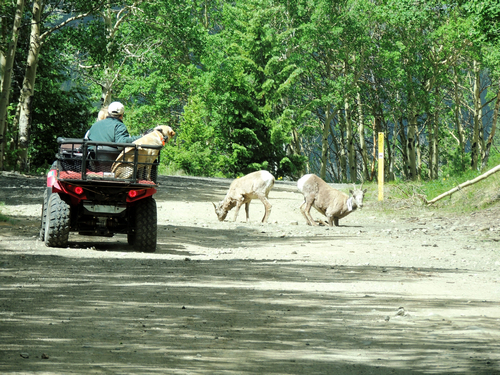 Bighorn have a lick in the road east of the pass.